This was the July 21st pre-order from Cosmic Cleanse ScentSations. I received the first shipment a while back but it came crushed and badly damaged. I had many casualties including a milk bath that was completely emptied over everything else and lids that were off and floating about the box. It was a nightmare. I can tell you what wasn't a nightmare... Heidi's response to my situation. She was an angel. I sent her photos and explained the matter and she quickly replied that replacements (including some labels) would be in transit. They arrived a couple weeks later and now I am just getting around to showing y'all what I picked up. This time around orders were not combined. I did place one larger order and then one smaller one for minis but tried to keep it two orders so shipping wasn't crazy. I love Heidi's Unicorn Ashes (basically bath bombs that have been kept loose instead of packed and formed into shapes) so I figured I would like her Milk Bath too and I do. 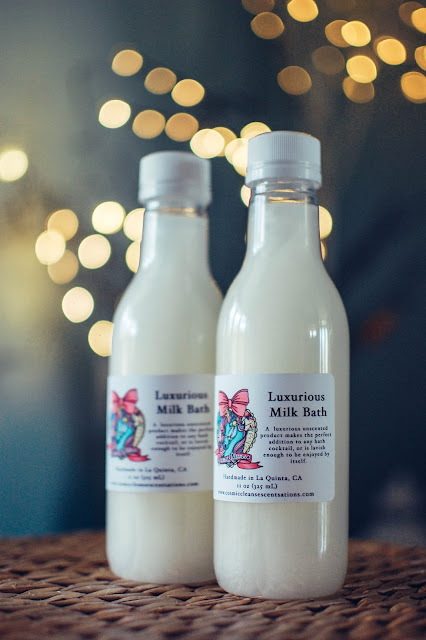 It is more of a creamy bubble bath rather than a milk bath. There is no scent so it makes for a great base to add other scented bath salts or perfume oils to. These ran $13 each. 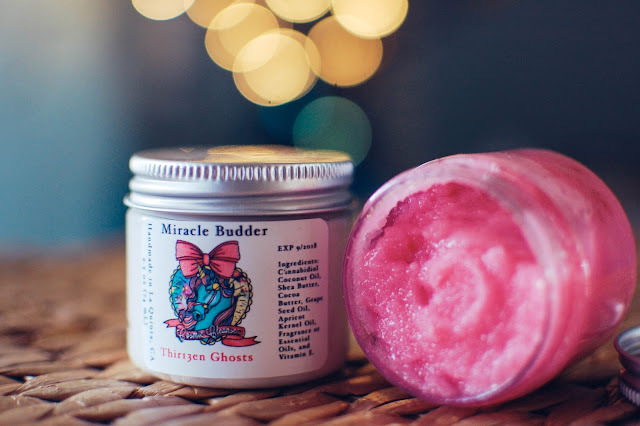 I add this first to my bath and it creates huge mounds of bubbles and it is CBD infused so it is great for when I have aches and pains from my cycle or just not feeling well. I would buy this product again in a heartbeat. I love Heidi's products for sure, but it is sometimes harder for me to find scents I love. Her strong game is fizzy fruity sweetness and she does it well. She also does peppermint and lavender well but they are not often offered in more than one scent per release. 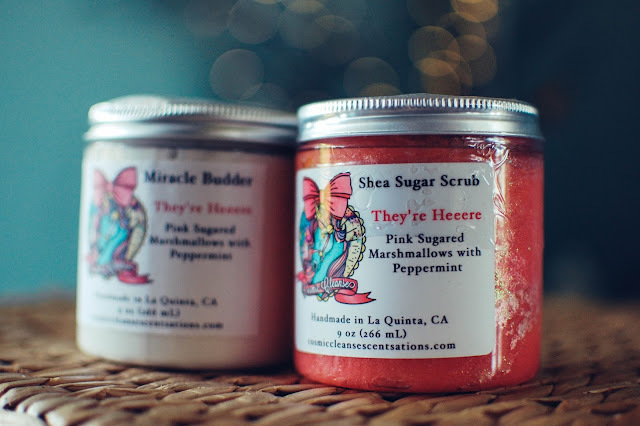 This time the mint was in a scent called They're Heeere which blended Pink Sugar, marshmallows and peppermint. I love it. I probably like Hoochie's Palace a touch more with the lavender but this is pretty darn nice. I picked it up in a full sized scrub ($13) and two Miracle Budders ($12), of which I have already emptied one at the time of this writing. I love this stuff. 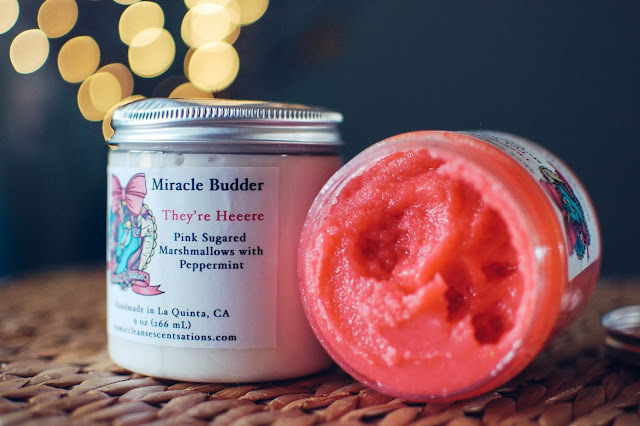 It really does work for minor burns to take the pain away, soreness, improved complexion and soothing minor anxiety from my own personal experience and those of my family members. I love the emollient formula of the scrub but I do wish it was glitter-free. I know, I am an old fuddy duddy, but I do find glitter rather annoying on the body these days. I feel like I find it everywhere on my face and bed and bath tub. I am not into clubbing (do they even call it that anymore?) so no glitter for me (unless I am going to a Ren Fair and need to pose as a fairy). 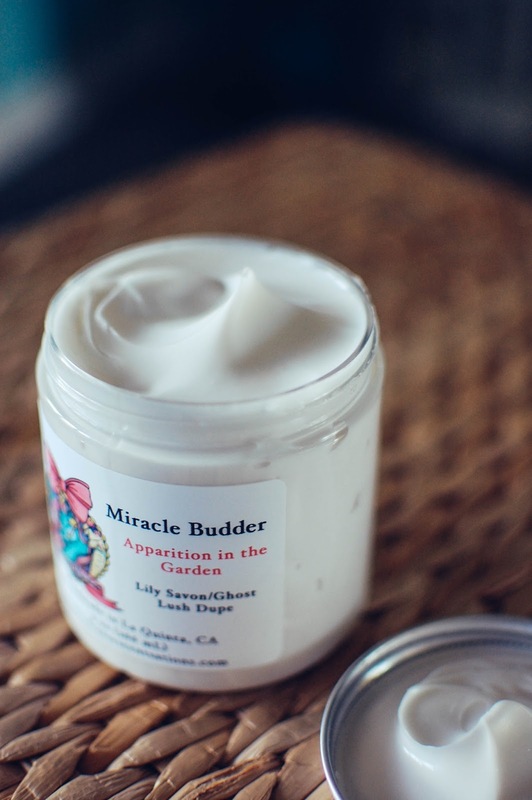 Apparition in the Garden was another scent I gravitated towards in the full sized Miracle Budder. 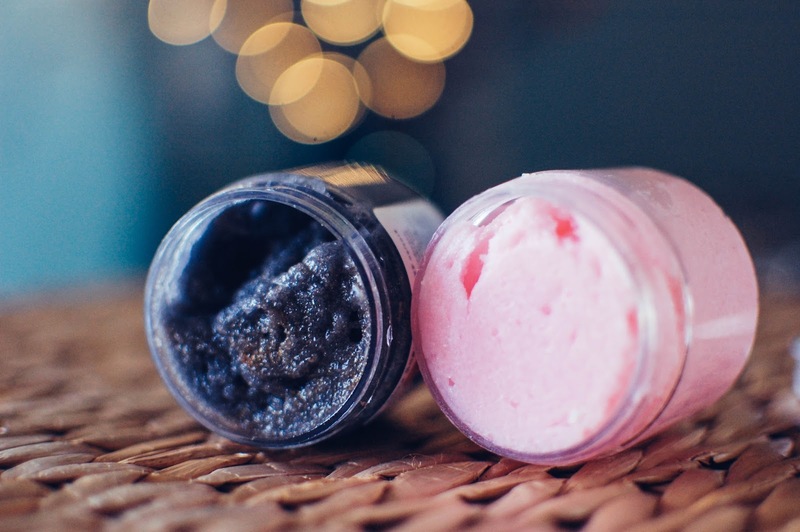 It is a Lush dupe that smells of soft musky florals like lily and jasmine, powdery and lovely. It makes for a wonderful spring scent. I like it in body care but I probably would not like it in a wax. It basically smells like a fancy soap. In the minis ($3.75 each) I got a little bit more experimental. I picked up Thirt3en Ghosts which combines wildberry marshmallow and spun cotton candy. It smells incredibly good. The wilberries are candied and sweet and full of juicy sugary nectar. This smells like the ultimate berry flavored cotton candy. I should have gone full sized. Donnie Darko is a fall scent that mixes up pecan pie, churros and whipped cream. I normally don't delve too deep into foodie categories in body care but I am finding I sometimes crave them in the autumn and winter months. Donnie Darko, believe it or not, doesn't come off as too foodie or bakery at all. It smells like deep caramel with just a touch of soft spice and loads of creamy vanilla. I do see where the pecan pie fits in. Almost like it is just that yummy gooey center of the pie without too much nuttiness. The sugary vanilla keeps it from being heavy. Love. Look at that pretty glitter! 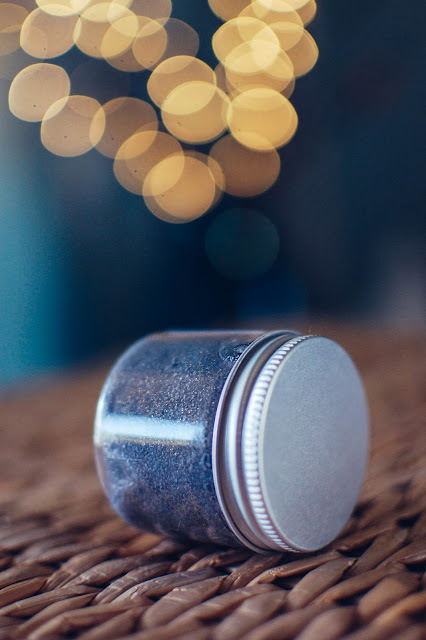 Yes, I can admire it in the jar and then immediately curse it on my skin. It is still pretty. I did pick up a mini whipped soap in They're Heeere as well as one tin of Headache Be Gone ($7.50) and a lip balm in Janine's Pink Cupcakes ($4.00). I have not had a chance to try out the Headache salve since I am a wimp and immediately take Tylenol or Advil when I am in pain usually but I will force myself to soon. I have been using the lip balm and I must admit that I am not really digging it. It feels good on the first 5 minutes and then makes my lips feel even more dry very soon after. By and far I am in love with my order. I do realize that Heidi had some major struggles with the new jars and lids she tried out this opening and my heart goes out to her. I cannot even imagine how awful that must have been for her when they started malfunctioning. She handled it like a professional and showed exemplary customer service. I will be back for more when she opens for another pre-order in the future. Are you a fan of CBD infused products? I notice them more and more, even in the mall recently. 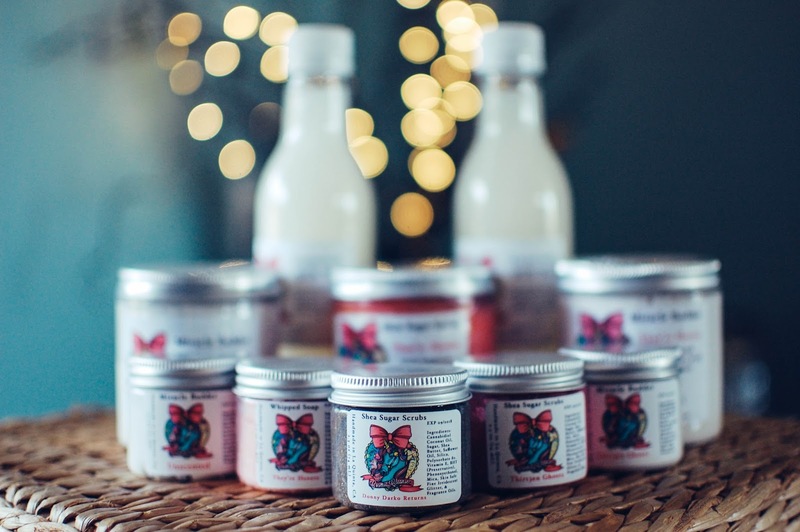 Did you get anything from Cosmic Cleanse the last two openings? What scents and products of Heidi's do you love?